The hydrodynamic bearing is an extraordinary device. There are 3000 mm diameter bearings supporting loads of 7 MPa at less then one rpm and 30 mm bearings supporting rotors that operate at tens of thousands of rpm. And more, these bearings can run for decades with little or no wear. Unfortunately, there are also an extraordinary number of factors that can affect and cause bearing problems. Lubricant contamination, misalignment, and other adverse operating conditions degrade thermal performance. Vibration must also be considered as the bearing contributes to system dynamics. Failures can be devastating and so it is important to share knowledge on these subjects. Many researchers have provided valuable theory, experiments and models regarding bearing behavior under adverse and unusual operating conditions. This paper contributes four cases of unusual behavior that have been encountered in high-speed turbomachinery where few references were found in literature, and towards which Kingsbury has devoted effort and time in tests and studies. The first case addresses offset pivot journal bearings. Pad temperatures are reduced by offsetting the pivot. However, some machines can experience reverse rotation under temporary or adverse conditions. Tests were performed to determine if offset pads can accommodate reverse rotation without damage. The other three cases are different in that the unusual behavior occurred at conditions that would typically be considered normal. The phenomena include low amplitude broadband radial vibration, sub-synchronous axial vibration, and high thrust bearing temperatures under low loads. These cases were reported in working machinery and caused sufficient concern to stop production. Laboratory tests were able to duplicate these phenomena, which allowed investigation and design of a solution for all three cases. Results are presented with some theory, hypothesis, or discussion. The intention is that this information will be of value to researchers and other personnel involved with design and prediction of hydrodynamic bearings in high-speed turbomachinery. Would you like to talk with a Kingsbury engineer? Click here. Pad temperatures are significantly reduced by offsetting the pad pivots in the direction of rotation [1-5]. Unfortunately, reverse rotation can occur in certain types of machinery and applications by intentional design, or in the case of adverse conditions. This is a concern when designing an offset pivot bearing for an application because the offset is in the wrong direction during the reversal. 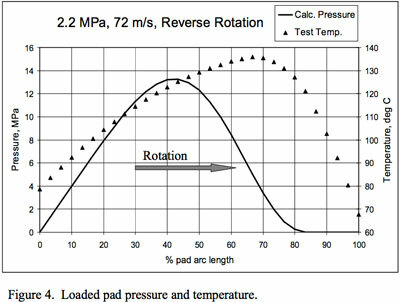 As pad temperatures improve going from a center to an offset pivot design, it is logical that the reverse rotation will run worse, and so it becomes important to assess if the offset design can withstand the reverse rotation operating conditions without damage. Test data were acquired on a test rig developed by the National Research Council Institute for Aerospace Research. A full description is given in reference . The rig is capable of applying a range of loads and speeds to a single test bearing assembled around a shaft. The test bearing is a conventional 5-pad flooded bearing with a nominal diameter of 152.4 mm and a pad axial length of 66.7 mm. The pads have a 60 degree arc and are steel with a babbitt surface. The assembled diametric clearance is 0.23 mm, and the nominal preload is 0.25. The pivots are offset 60 percent of the pad angle in direction of shaft rotation. Pivots are rolling contact with radii of curvature in the circumferential and axial directions. The circumferential curvature permits each pad to change its tilt to accommodate changing operating conditions. The axial curvature allows the pads to align with the shaft. The pads are instrumented with an array of thermocouples with the tip of each thermocouple located 0.5 mm below the babbitt surface. Lubricant is fed to the pads through five radial holes that direct oil from an annulus on the outer diameter of the bearing to the spaces between the pads. Oil exits through the clearance between the shaft and labyrinth seals on either side of the bearing, such that the bearing cavity is flooded and at a slight positive pressure. The lubricant was an ISO VG 32 turbine oil supplied at 49 °C. 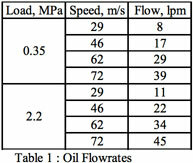 Oil flows were set for each operating condition (Table 1). Tests were first performed with the bearing installed in the proper direction of rotation. Pad temperatures were recorded for each load and speed combination after steady-state conditions were attained. The test bearing was then removed and installed for reverse rotation and a second set of data recorded, in which case the pivot offset is 40 percent of the pad angle in the direction of rotation. The data in Figures 1 and 2 are pad temperature profiles obtained by plotting centerline thermocouple temperatures against their relative angular position in the bearing. The loaded pad pivot is at an angular position of 270 degrees, bottom dead center. Figure 1 are pad temperature profiles for the bearing running in the correct, forward direction of rotation. Figure 2 are corresponding pad temperature profiles for reverse rotation. Some common trends for forward and reverse rotation can be ascertained from Figures 1 and 2. The temperatures of every pad increase in direction of rotation and with speed. It is noted that the loaded pad temperatures increase in direction of rotation to a maximum and then decrease to a lower level towards the trailing edge. The decrease is more dramatic in the case of reverse rotation. It is also noted that reverse rotation maximum temperatures are much hotter, reaching 136 °C compared to 109 °C for forward rotation at the most extreme conditions tested. Figure 3 compares maximum measured temperatures for various operating conditions. Reverse rotation maximum temperatures ran 1 to 27 °C hotter depending on operating conditions. The pad surfaces were examined after tests and found to be in excellent condition, with no wipes or any indications of distress. Unlike the heavy array of thermocouples afforded in laboratory tests, field applications have only one or two detectors towards the trailing edge of the loaded pad. Should an adverse reverse rotation event occur, the detectors are then in the cooler leading edge region and provide no information on maximum babbitt temperatures encountered during the event. It is therefore helpful to have a model that accurately predicts reverse rotation pad temperatures. Towards this end, the author has evaluated some computer models against these data. Details are beyond the scope of this presentation, but two observations are noteworthy. First, the codes were able to predict the large variation between 60% and 40% offset temperatures within reasonable accuracy (approximately 5 °C). Second, it is interesting to note that the calculated pressure cavitation at 80 to 100 percent of the pad arc correlates with the significant drop in the measured trailing edge temperature (Figure 4). Cavitation is a plausible explanation for the pronounced temperature drop and also affects the reverse rotation pad equilibrium position. In other words, the pad is behaving somewhat like a center pivot pad of shortened arc length. It is intended that sufficient information is provided here to allow other researchers a means to compare and evaluate models against data on offset pivot journal bearings in reverse rotation. 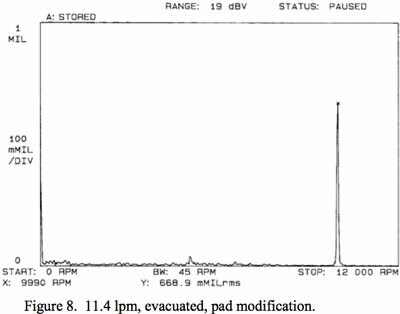 Note that while inspection found no indications of distress, local pressures under reverse rotation at 72 m/s, 2.2 MPa approach ASTM B23 Grade 2 babbitt yield points, so there is little margin of safety beyond this operating condition. Reference  contains additional information on the tests. Figure 5 was provided by an equipment manufacturer to point out an unusual vibration signature encountered during spin tests of a high-speed compressor. As reported, the unique signature is characterized by low amplitude, broadband, radial sub-synchronous vibrations (SSV). The amplitudes are of the order of 0.0025 mm peak to peak and fluctuate randomly. There are no discrete frequencies. The manufacturer first noticed the SSV using another vendor’s direct-lube bearings but similar signatures have been encountered with other bearing designs and in other types of machines. The frequencies and amplitudes are low and do not appear capable of causing problems. Even so, purchasers may not accept the machine until tests show the issue has been resolved. The resulting test stand delay backs up production and delivery. Additional time, effort, and money are expended in modifications and subsequent tests. In other words, this small signature has the potential to cause significant repercussions. The issue prompted a research project performed on Kingsbury’s high-speed test rig described in reference . The rig has a test shaft driven by a variable speed gas turbine through a flexible coupling. The test shaft is approximately 1.5 meters long and 127 mm in diameter, supported at either end by a pivoted shoe journal bearing. Two orthogonal probes are mounted near each journal bearing to record radial shaft vibrations. 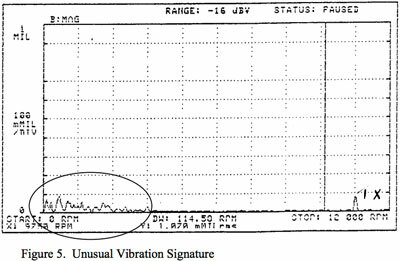 A Hewitt-Packard Spectrum Analyzer was used to acquire FFT vibration signatures. Parametric tests of a variety of journal bearing configurations and operating conditions were studied over the course of the project. Data presented here are for pivoted 5-pad LEG® journal bearings at a shaft speed of 10,000 rpm and a low, 0.14 MPa projected load. LEG® is a direct lube bearing design that provides cool oil directly to the leading edge of the pads thereby reducing oil flow requirements, power loss, and pad temperatures . An important feature is evacuated operation, accomplished by removing side oil seal restrictions. The bearings have a nominal diameter of 127 mm and a pad axial length of 57 mm. The pads have a 60 degree angle, a 60% offset, and are steel backed with a babbitt surface. The assembled diametric clearance is 0.23 mm and the nominal preload is 0.15. Tests were run with ISO VG 32 turbine oil supplied at 49 °C. It was possible to duplicate the unusual vibration signature in the test rig with the bearings described above. Figure 6 was recorded for an oil flow of 11.4 liters per minute (lpm), a typical flow for a direct lube bearing at these operating conditions. (The y-axis plots peak to peak amplitudes in mils. 1 mil is equal to 0.0254 mm). Increasing the flow reduced the amplitudes for this configuration, but did not entirely eliminate the low frequency SSV. Complete elimination required installation of floating oil seals to obtain a flooded configuration, and an increase in oil flow to 22.8 lpm. The resulting signature is shown in Figure 7. This solution is used by some vendors. Unfortunately, the solution is essentially a typical flooded bearing design that has higher flows, power loss, and pad temperatures. Further study of other parameters suggested that the low frequencies may result from air entering the oil film. Based on this hypothesis, a design was conceived that might eliminate the SSV while maintaining some direct lube benefits. Pads from the test bearing were modified with narrow circumferential grooves cut in the babbitt near the edges of the pad, to capture and redirect side leakage towards the leading edge of the next pad . In this way, additional oil is made available to the leading edge without increasing the oil flow to the bearing. The modified pads were reinstalled and tested in an evacuated condition (no oil seals) with results shown in Figure 8 for 11.4 lpm and tested as low as 7.5 lpm with negligible low frequency SSV. Of some twenty-six test configurations, this was the only low flow evacuated design that reduced SSV to levels typically experienced in flooded designs at high flows. Power loss and pad temperatures increased slightly, but were still lower then corresponding flooded designs. Based on tests, field experience, and correspondence with manufacturers, this signature has been observed in other bearing designs and different types of machines. The signature is more pronounced in light rotors and when using direct lube bearings. It is important to note that low frequency SSV can also occurs in flooded designs. The tests indicate that the bearing not only needs to be flooded, but that the oil flow, seals, and exit restrictions have to be properly sized to provide positive back pressure in the bearing cavity. It is also important to note that direct lube bearings have been used for many years and there have been no documented evidence that this type of low frequency SSV poses any threat to safety or longevity of the machinery. An ideal solution would be to accept the signature as normal behavior but this does not seem likely. Tests and studies to better understand the cause and consequences of the phenomenon are being pursued. In the meantime, the direct lube bearing with modified pads has been successful in eliminating low frequency SSV in several field applications for compressors, turbines, and high-speed gear boxes. 3. Axial sub-synchronous vibration There is little, if any, published literature on axial sub-synchronous vibration (SSV) in turbo-machinery. Reference  studies vibrations in slack side thrust pads, which produce audible noise and tends to damage the pad pivots. The paper has been referenced regarding axial vibration, but does not actually measure or note any vibration response of the shaft. Another behavior unrelated to the topic is axial shuttling where the shaft drifts randomly in the set axial clearance when thrust loads are neutral. References were found that present nonlinear transient axial response analysis for a fixed geometry bearing system [10, 11], which is closer to the topic but do not present test data and are focused on ultra super harmonic response. The axial SSV under consideration here is a discrete, sub-synchronous vibration of very high amplitude, sometimes traveling the full set clearance of the bearings. The vibrations are often reflected in the radial probes. When this axial SSV shakes the foundation of a powerful machine, there is no doubt that a dangerous situation exists. The problems have been few in past experience but seem to be occurring more frequently. This may be due to the trend for faster machines, but some engineers suspect the high pivot offsets and direct lube bearings often used in high-speed applications. This axial SSV usually occurs in no-load situations, which is the case encountered during mechanical spin tests. Successful solutions have been to increase the oil flow, to preload the bearings by reducing clearance, to create asymmetry by using different loaded and slack bearings, to reduce the pivot offset, and to modify the balance piston thereby applying some load. A problem is that these solutions are not always reliable or repeatable. The inconsistent solution results and the more frequent occurrences prompted a research project, also performed on Kingsbury’s high-speed test rig described in reference . An axial probe was mounted to record vibrations for the shaft described in the preceding section. Data were acquired using National Instrument data acquisition equipment and LabView software. A double element thrust bearing is tested, one bearing on either side of the test shaft’s thrust collar. Parametric tests of a variety of thrust bearing configurations and operating conditions were studied over the course of the project. Data presented here are for pivoted 6-pad equalizing thrust bearings. The bearing pad surface has an outer diameter of 266 mm, an inner diameter of 133 mm, a 51 degree angle, and a 60% offset pivot. Tests were run with ISO VG 32 turbine oil. The axial SSV was successfully reproduced on the test rig. FFT signatures plotted against record #, representing time in seconds, produce a map of frequencies and amplitudes. (The y-axis plots peak rms amplitudes in mils. 1 mil is equal to 0.0254 mm). Figure 9 are data for a 50 to 200 Hz speed ramp for a set bearing clearance of 0.31 mm. Axial SSV is noticeable at speeds above 200 Hz. Figure 10 is a duplicate with the same bearings, except that the set bearing clearance was increased to 0.48 mm. SSV occurs at a speed of 150 Hz, and drops out at 200 Hz. It can be envisioned that if this were some machine that was designed for a maximum design speed of 175 Hz, there would be no indication of an axial SSV problem (Figure 9) until a slight increase in clearance shifts the SSV into range (Figure 10). 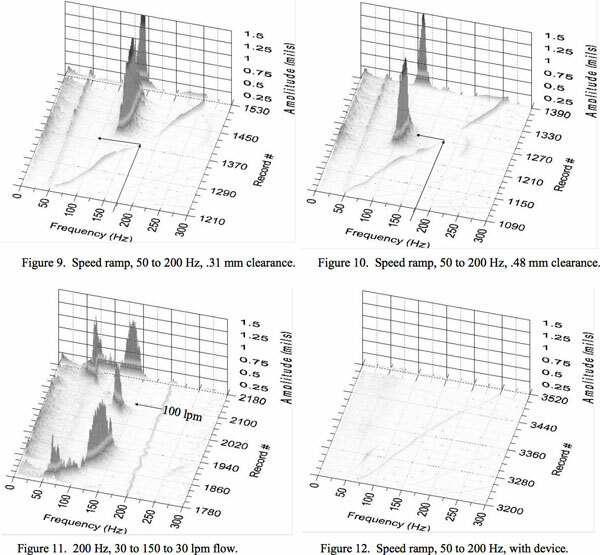 More complex behavior is captured in Figure 11 for a constant speed of 200 Hz where bearing oil flow is varied from 30 to 150 and back to 30 lpm over the course of the recording. The peak near record #2100 occurred at a flow of 100 lpm. Again, if this were a production machine on tests, it can be concluded that the SSV may be eliminated by either increasing or decreasing the oil flow to the bearing. The figures show only a few of the parameters studied. Test parameters included load, speed, flow, clearance, offset, direct vs flooded lubrication, inlet temperature, and geometry. Results clarified some apparent inconsistencies in solutions mentioned earlier. Specifically, it is not correct to generalize the effect of a parameter. An increase or decrease can eliminate or cause axial SSV depending on how the SSV shifts in relation to the particular operating condition. Test results support field experience that axial SSV is unlikely under load, but further indicate that the load must be of some significant magnitude, as SSV was observed in some tests at low loads. The solution to apply a slight load by modifying the balance piston therefore may or may not resolve the problem during spin tests. This is not a good solution in any case because the machine may encounter a neutral position and subsequent axial SSV in the field. Solutions involving increased oil flow and tightened clearance are supported by tests, which further indicated that the converse, decreased oil flow and looser clearance, may also successfully shift SSV out of range. If clearance is used to eliminate axial SSV symptoms, it is important to account for possible clearance change over time. The tests did appear to support reduced SSV levels for lower offsets. It was not possible to generate any significant axial SSV in center pivot tests. However, it is again unwise to generalize because the test shaft is not as heavy or complex as a machine rotor, and axial SSV has been encountered in center pivot applications in field units. The solution to reduce offset also has consequences of higher bearing temperatures and lower load capacity. The belief that evacuated operation (direct lube) causes axial SSV is refuted by the tests. This is another case where SSV was noted in both flooded and evacuated operation and where either configuration just shifts the SSV to other frequencies. The belief that asymmetric bearings (different geometries on either side of the collar) disturb the tendency for axial SSV is also refuted by the test data. The project is presently in a phase to develop a model to predict the complex behavior. In the meantime there existed a need to solve the problems more precisely. Towards this end, a device was conceived and tested. It consists of a simple groove and seal installed in one of the bearings  and has successfully eliminated dominant and lower frequency SSV in tests and in field applications for various manufacturer compressors. Example test results are shown in Figure 12, which is a duplicate run of Figure 9 conditions, but with the device installed. 4. High-speed / Low-load Another unusual phenomenon was discovered while investigating higher than expected thrust bearing pad temperatures during mechanical spin tests of a high-speed compressor. A low-pressure spin test produces low thrust loads that are expected to give low pad temperatures. The high temperatures therefore raised doubt that the bearing would be able to withstand loads in actual operation without failure. 4.1 High-speed / Low-load - Test information The situation was investigated on Kingsbury’s high-speed test rig. Details of the rig and complete test results are documented in reference . Various double element thrust bearings were tested including center pivot and offset pivot, flooded and LEG® designs. Data presented here are for pivoted 8-pad equalizing LEG® thrust bearings. The bearing pad surface has an outer diameter of 266 mm, an inner diameter of 133 mm, a 38 degree angle, and a 60% offset pivot. Tests were run with ISO VG 32 turbine oil supplied at 49 °C. Thermocouples are imbedded in the babbitt metal of each thrust bearing pad, positioned within .76 mm of the surface. Average 75/75 temperatures are compared in figures. 75/75 represents a location on the pad surface 75% of the pad arc from the leading edge and 75% of the radial width from the inner diameter. Pad temperatures were recorded for each load/speed combination after steady-state conditions were attained. 4.2 High-speed / Low-load - Test results Figure 13 is a plot of data recorded for various the various loads and speeds tested. Of interest is the pronounced temperature humps at low loads. The levels are similar to those experienced on the compressor manufacturer’s test stand except that the spin test setup did not have the capability to increase the thrust load. As load is further increased, the temperatures are noticed to reduce until they begin to steadily rise in an expected fashion. A separate study of temperatures over the pad surfaces indicated that the high temperatures extended across most of the pad from leading to trailing edge for the low load peaks. The excessive leading edge temperatures suggested a restriction of flow in the film and prompted the design and trial of a leading edge taper . A duplicate set of tests were performed with modified pads that effected a dramatic reduction in the highspeed/low-load temperatures. Results are plotted in Figure 14. Again, there was a tendency to suspect the direct lube design and high offsets, but flooded designs and different offsets were tested and showed similar behavior. Complete results of these tests are documented in Reference . In summary, the effect of this phenomenon is higher than expected pad temperatures in pivoted pad thrust bearings operating at high speeds and low loads. The high pad temperatures are accompanied by excessive oil drain temperatures. The phenomenon becomes apparent at mean sliding velocities above 90 meters per second and at unit thrust loads between 0 and 0.7 MPa. A taper modification applied to the leading edge dramatically reduces the temperatures in this region. 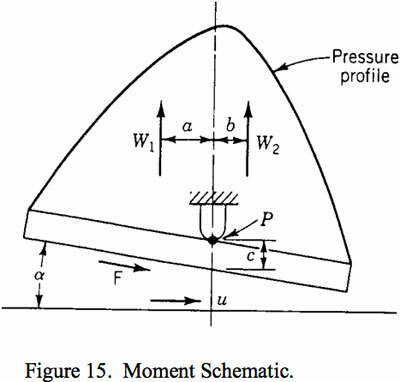 It is suspected that the phenomenon is caused at low load when the moment due to viscous drag F on the pad surface (Figure 15) is larger than the counter moments W created by hydrodynamic film pressures. If so, the pads may operate with little or no tilt resulting in restriction of oil and high temperatures, consistent with the hot leading edge temperatures recorded in tests. Film forces begin to dominate as higher loads are applied, a hydrodynamic tilt is formed, and the pad temperatures behave as expected. The “low-load” notation is important because zero load temperatures are typically cool (Figure 13). In a pure zero load case the collar can be centered in the set clearance and relatively far away from the pads on either side. A separate study suggests some closer proximity is required for the phenomenon, which is provided when a low load is initially applied to shift the collar closer to one of the bearing faces. Based on this hypothesis, the leading edge taper was designed to provide a hydrodynamic force at the leading edge with a counter moment sufficient to overcome the frictional drag. Designs have been successfully applied in actual compressor spin tests for different manufacturers, and are running well in the field. Dmochowski W., Brockwell K., DeCamillo S. & Mikula A. (1993) A Study of the Thermal Characteristics of the Leading Edge Groove and Conventional Tilting Pad Bearings. ASME Journal of Tribology, 115, pp. 219-226. Bouchoule C., Fillon M., Nicolas D. & Barresi F. (1995) Thermal Effects in Hydrodynamic Journal Bearings of Speed Increasing and Reduction Gearboxes. Proceedings of the 24th Turbomachinery Symposium, Texas A&M University, pp. 85-95. Simmons J. & Lawrence C. (1996) Performance experiments with a 200 mm, Offset Pivot Journal Pad Bearing. STLE Tribology Transactions, 39, pp. 969-973. DeCamillo S. & Brockwell K. (2001) A Study of Parameters that Affect Pivoted Shoe Journal Bearing Performance in High-Speed Turbomachinery. Proceedings of the 30th Turbomachinery Symposium, Texas A&M University, pp. 9-22. Brockwell K., DeCamillo S. & Dmochowski W. (2001) Measured Temperature Characteristics of 152 mm Diameter Pivoted Shoe Journal Bearings with Flooded Lubrication. STLE Tribology Transactions, 44, pp. 543-550. 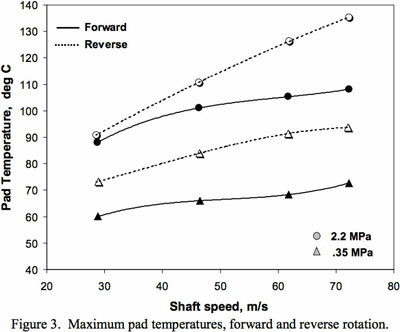 DeCamillo S., Brockwell K. & Dmochowski W. (2006) Test Results Comparing the Effects of Reverse Rotation on Offset Pivoted Shoe Journal Bearing Pad Temperatures. STLE Tribology Transactions, 49, pp. 305-314. Wilkes J. & DeCamillo S. (2000) Evaluation of a High Speed, Light Load Phenomena in Tilting Pad Thrust Bearings. Proceedings of the 29th Turbomachinery Symposium, Texas A&M University, pp. 177- 185. Wilkes J. & DeCamillo S. (2002) Journal Bearing. United States Patent No. 6,361,215 B1, Mar. 26, 2002. Gardner W. W. (1998) An Experimental Study of Thrust Pad Flutter. ASME Journal of Tribology, 120, pp. 577-582. Zhu Q. & Zhang W. J. (2003) A Preliminary Nonlinear Analysis of the Axial Transient Response of the Sector-Shaped Hydrodynamic Thrust Bearing-Rotor System. ASME Journal of Tribology, 125, pp. 854- 858. Shiau T.N. & Hsu W. C. (2005) A Nonlinear Analysis of the Axial Steady State Response of the Hydrodynamic Thrust Bearing-Rotor System Subject to a Harmonic Excitation. Proceedings of the GT2005 ASME Turbo Expo 2005. Wilkes J. & DeCamillo S. (2005) Thrust Bearing. United States Patent Application No. 10/394,960. Wilkes J. & DeCamillo S. (2000) Thrust Bearing. United States Patent No. 6,089,754, Jul. 18, 2000. The authors are grateful to the National Research Council of Canada for their test rig and effort in acquiring data regarding the effects of reverse rotation on offset pivot journal bearing pad temperatures, and to Kingsbury, Inc. for permission to publish the results of these four projects.